Welcome to OptinMonster, the best lead generation software available for all types of websites! OptinMonster will help you increase your conversions and build your web presence. 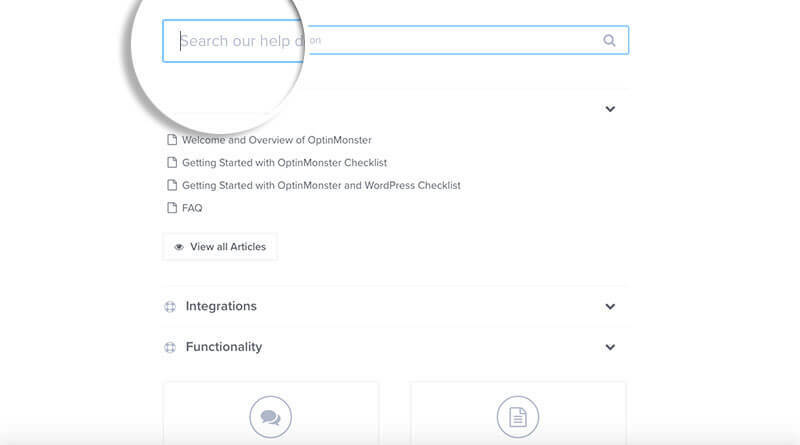 This overview of OptinMonster is designed to introduce you to the major areas of OptinMonster’s website and help you get started creating new campaigns quickly. Looking for information about the new drag and drop Builder? See our Builder overview. You can find a variety of items the moment you log in. We’ll cover each of these items below so that you will know exactly what to do. 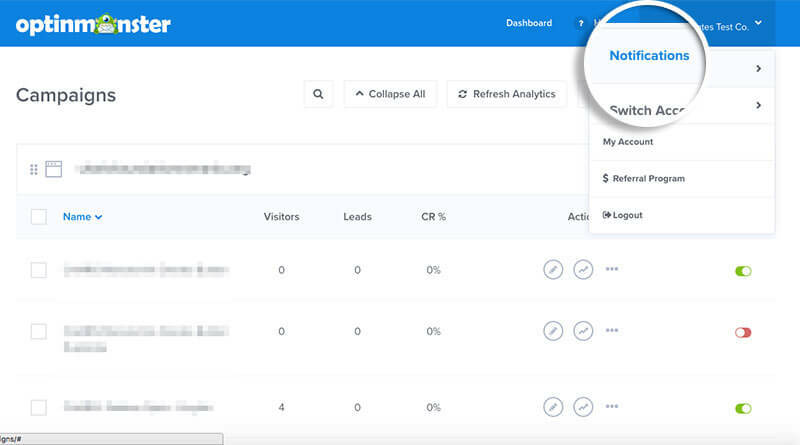 At any moment while logged into your OptinMonster account, selecting the Dashboard button will bring you back to the Dashboard screen. The Dashboard button is your “OptinMonster Home Screen”. In your Dashboard you will find all of your campaigns. If you are just getting started, it may a little bare right now, but that will change as soon as you create your first campaign. You’ll also see high-level conversion analytics for each campaign for the past 30 days. 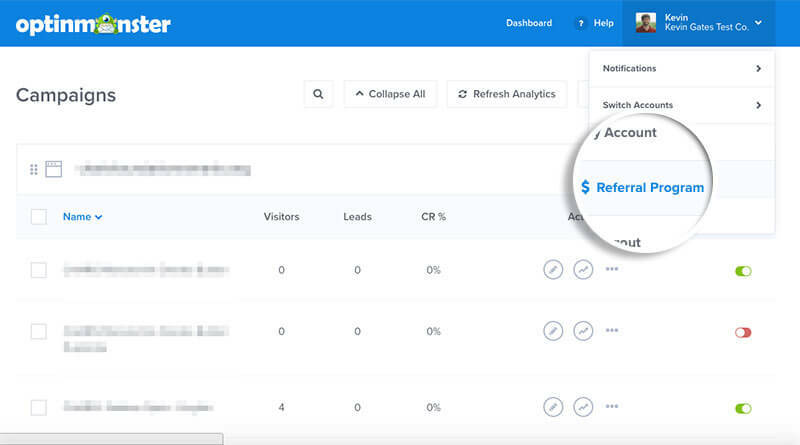 You can quickly edit, create split-tests, and grab the embed code for each of your campaigns from this screen. By clicking the ? Help button, you will have an overlay appear which will give you access to both related documentation and the option to submit a support ticket. The moment you start typing in the search field, we will filter through our documentation according to what you have typed in to provide the most relevant results. You can find all the guides you need in a matter of seconds! On the help screen, if you scroll to the bottom, you will see the Submit a Ticket option on the bottom left. 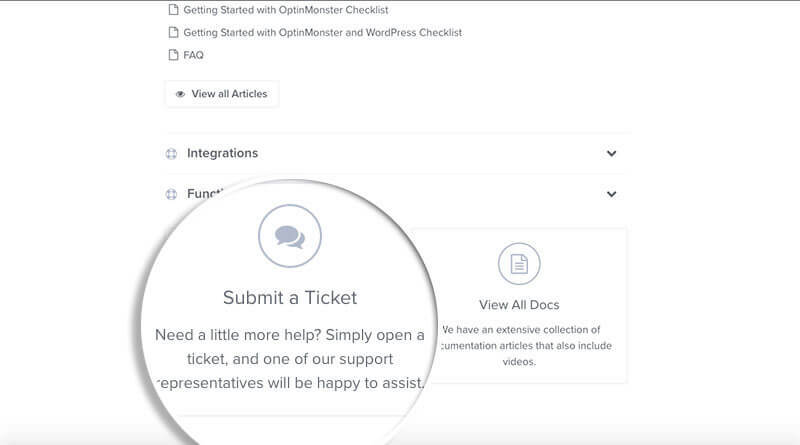 Selecting the Submit a Ticket button will take you to our support page, where you can select your topic, any related campaigns, and the ticket will come straight to our inbox. Using the support form while you’re logged-in will always speed up your reply time compared to submitting a ticket when you’re logged-out or when you email directly. If you click on the Notifications option, you will see all the in-app notifications that we’ve published, containing the latest features, new documentation, important notices, and links to our latest blog posts. Would you like to earn 20% on each referral sale? You can by becoming an Affiliate of OptinMonster. By clicking on the $ Referral Program button, you will be taken to our Affiliates page. This option is self-explanatory. Once you are finished with your OptinMonster updates, you can log out of your account by clicking Logout. The final major item on the home Dashboard screen is the Create Campaign button. Selecting this button allows you to begin creating a new campaign. See our Builder overview for more information about OptinMonster’s new drag and drop Builder. We hoped you enjoyed this overview. Please let us know if you have any additional questions by sending us a support ticket if you can’t find an answer in our extensive documentation.